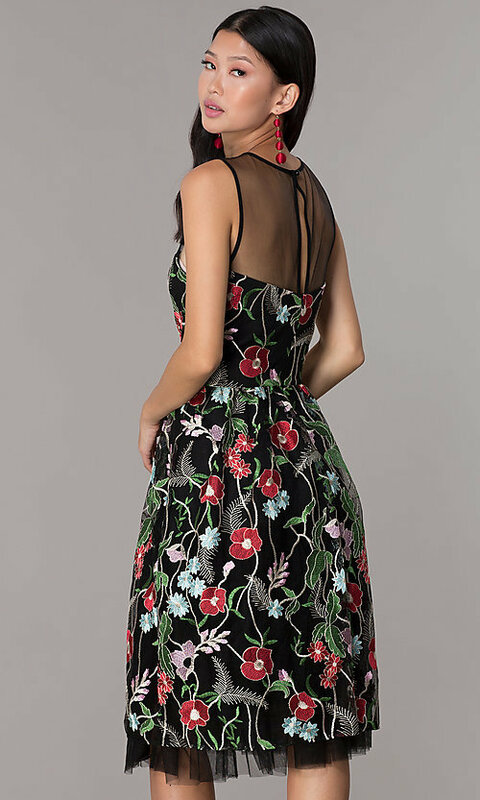 Charming by design, this black mesh party dress is a beautiful canvas for the multicolored floral embroidery. The sleeveless a-line semi-formal dress features an illusion-sweetheart bodice with a sheer neckline that secures with a hook-and-eye closure over a back keyhole cut out. With a volumizing tulle lining, the knee-length flared skirt on the floral-embroidered party dress has a jersey lining for comfortable coverage. Additional sheer tulle trims the hem of the knee-length skirt and extends the short dress to an elegant tea length. Be beautiful in this embroidered black-mesh party dress for wedding celebrations, cocktail hours, and other semi-formal events.